This week I spent several days in the same classroom working with kindergartners on writing 5 sentence stories. I decided we needed to start with a concrete experience to write about. Then I saw Amy Lemon's How to Make Dirt Puddin' Unit and knew we had to have a worm day! Thanks for the inspiration Amy! The kids LOVED it!! 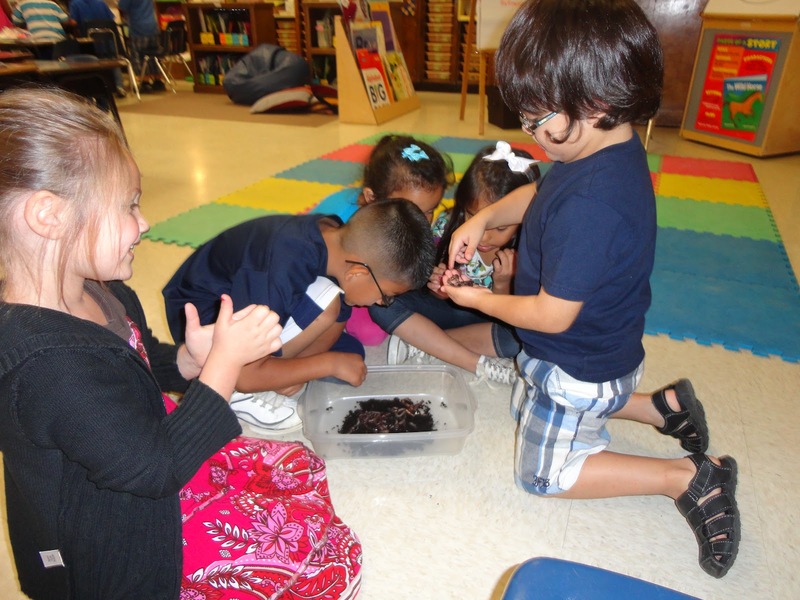 Day One - Worm Day - We read the book Diary of a Worm, made dirt cups to eat, made Amy's cute dirt cup craft, and used our 5 senses to explore real worms. Worm Day Specifics: I divided the class into three groups and set up three worm stations around the room. Each station took about 10 minutes to do. I did not stay in one station. Instead I moved around the room asking students questions and having conversations with them about worms and what we were doing. I bought worms at Wal-mart. I found them with the fishing tackle. I bought the largest ones and placed them in a small plastic shoe-box container. The students smelled them, touched them, moved them around, and gave them a close look. If I did this again, I would add magnifying glasses to this station. 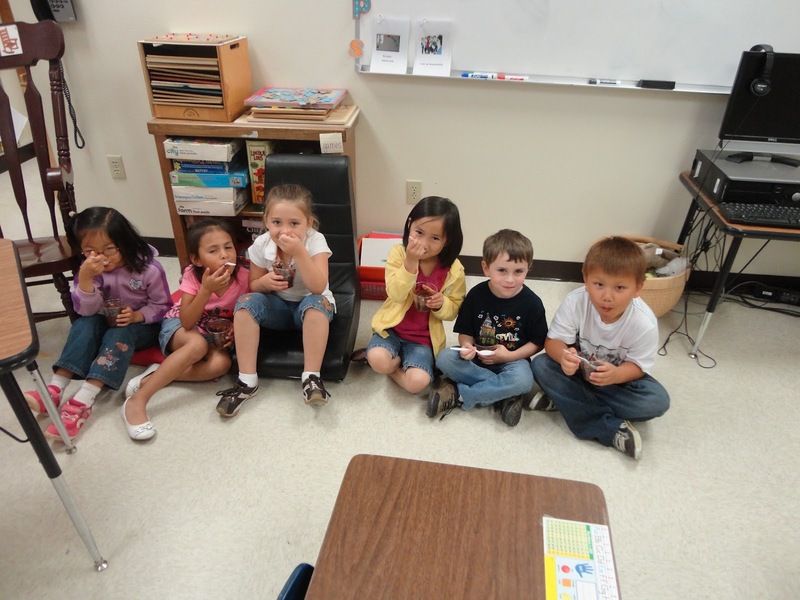 The classroom teacher stayed in this station the whole time to help kids with scooping pudding. The snack was set up buffet style. 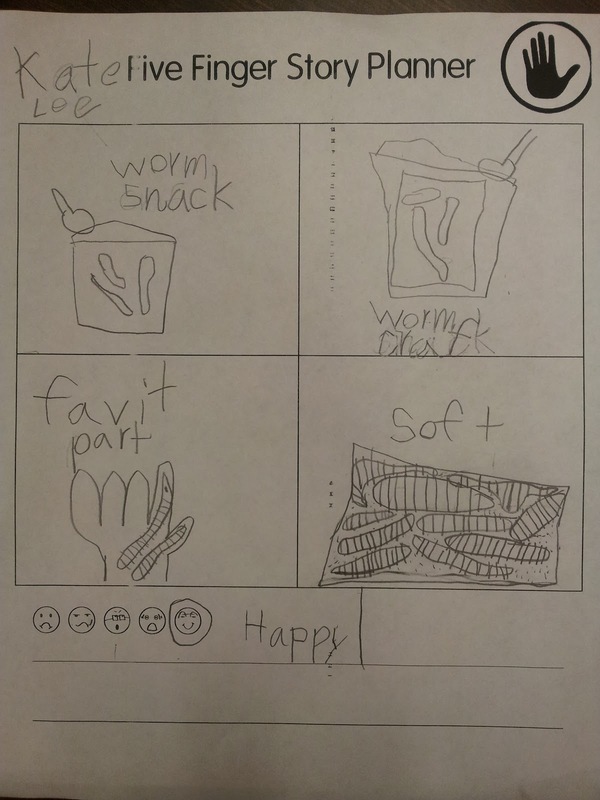 Kids moved down the line, adding pudding, Oreos, and worms to their cup. Then they sat together and at their snack. 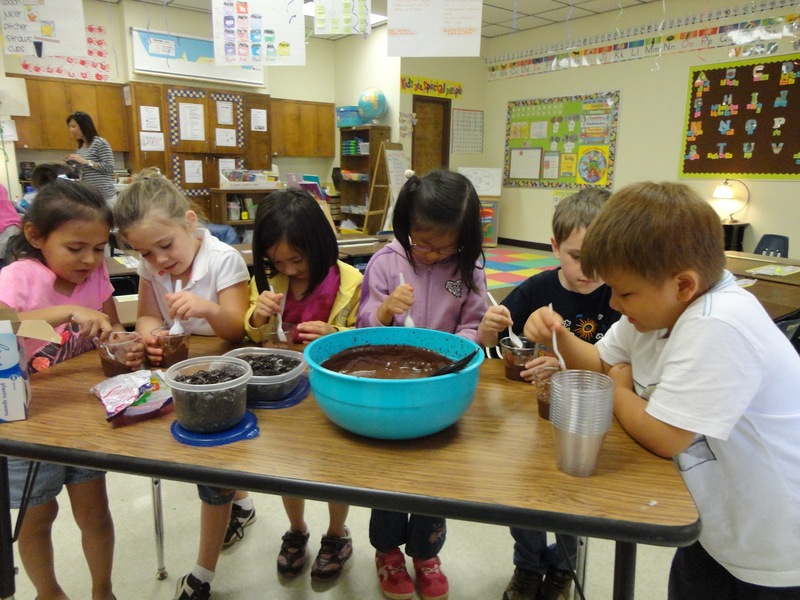 You can find a recipe for dirt cups in Amy's unit How to Make Dirt Puddin'. I pre-cut the pieces to save time. I set the craft up buffet style too. 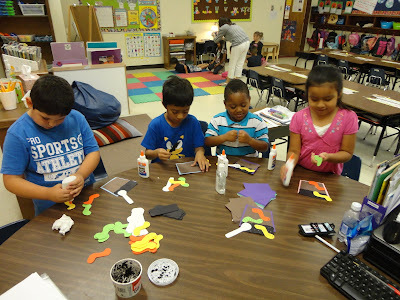 Students could see what order they needed the pieces in by the way they were laid out on the table. I had an example for them to look at as well. 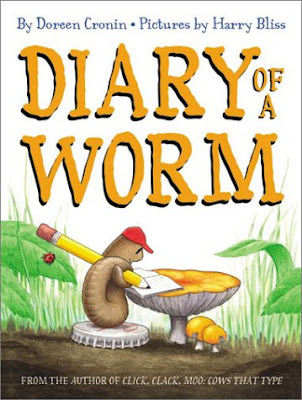 Throughout the worm day experience, I reminded students to pay close attention to what we were doing, how we did it, and how they felt about it because we were going to write about it later in the week. I also encouraged them to go home and tell people in their family about what they did to help them remember. Day Two- Using the Writing Planner- I found this Five Finger Planner from Melissa at Joyful Learning in KC. You can download the planner for free from Melissa's post. The planner worked great! Day Two Specifics: I brought the students to the carpet and reviewed all of the things we had done on worm day. Then I modeled using the five finger planner on chart paper for them. 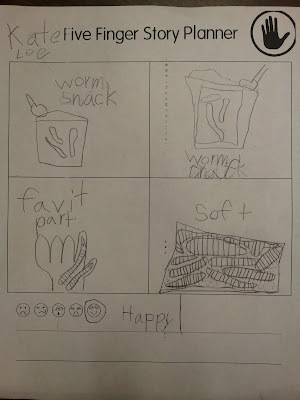 I modeling thinking aloud about what we did, the details of the day, my favorite parts, and how I felt about worm day. I stressed how we were only making pencil sketches for the drawings and single words or short phrases for the writing because this was just a planner to help us organize our thinking. After modeling, I gave students their own planner and had them put down their own thoughts about what they wanted to write about worm day. Day Three- Writing the Five Sentence Story- On the third day students used their planners to write their stories. 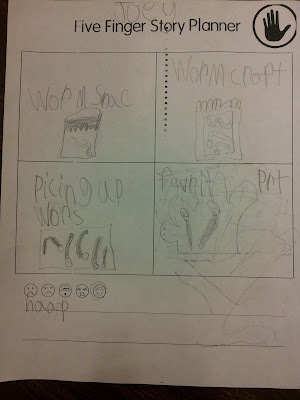 Day Three Specifics: First, we reviewed what we did on worm day and what we had written on our planners. Then I had students find their first box, read it, and think about the sentence they wanted to write to go with that detail. We talked about how our sentence needed to match the detail that was in the box on our planner. 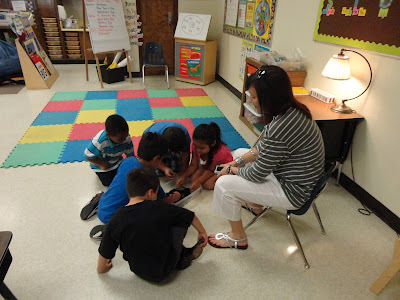 As students wrote, I walked around the room and conferenced with them as they needed it. When they were finished writing a sentence, they read it to me and then I directed them to move on. This step definitely needs to be modified to meet the needs of your classroom. Since I am not in this classroom all of the time and the students had never written a story over 5 pages or used a writing planner, I wanted to make sure they could read their sentences to me, that their writing made sense, and that they had matched what was on their planner to their sentence before they moved on. Students moved at their own pace and drew their picture once they were finished. To save time, the students only drew one picture, but if I was spreading the story writing out over several days I would have had them draw pictures to match each sentence. 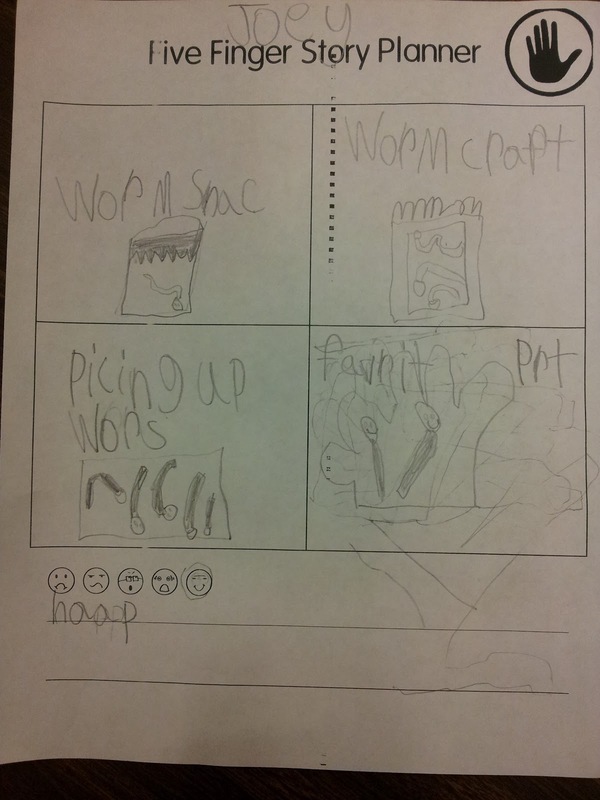 I really like your worm activities! Thank you for all the good ideas! 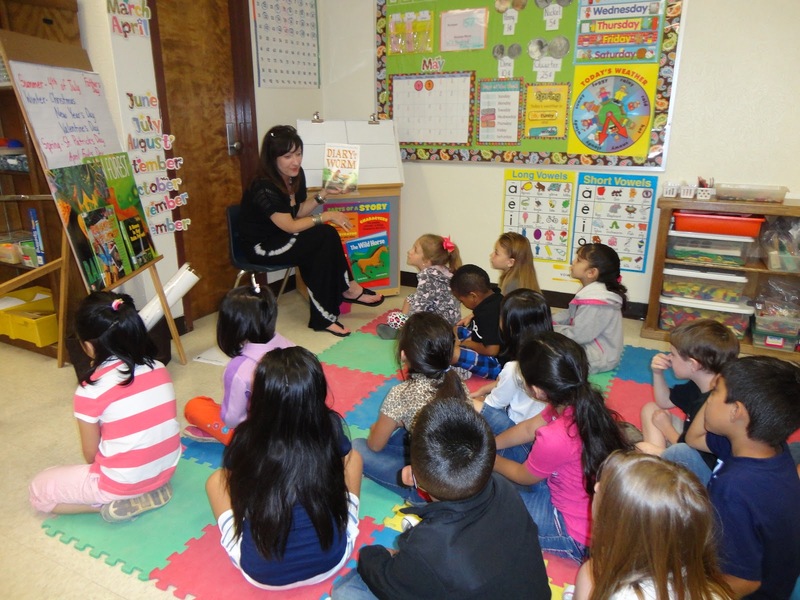 Cute activities to go with one of my favorite stories! !